his immediate tactical command. Accordingly, the amphibious operations at Roi-Namur, Majuro, and Eniwetok are described only in modest detail, compared with Kwajalein where Rear Admiral Turner carried the ball. There was the natural competition between the Northern Attack Force (TF 53) and the Southern Attack Force (TF 52) to complete first the conquest of their assigned half of the Kwajalein Atoll. This race was won handily by Rear Admiral Conolly, the Northern Attack Force, and the Marines of the Fourth Division under Major General Harry Schmidt, USMC. Several amphibious problems arose during the seizure of the outlying islands by the Northern Attack Force on Dog Day, and again on Dog Day plus one during the launching of the assault from within the lagoon. Since these amphibious experiences help form the stepping stones leading to later successes in the Pacific amphibious campaigns directed by Rear Admiral Turner, they will be briefly related. It might be observed at the outset that the complicated Landing Plan of the Northern Attack Force depended upon good communications. These would not exist at the amtrac level due to the grounding out of radio sets installed in the amtracs by the salt spray from the choppy lagoon waves. passes. There were neither artillery nor emplaced machine guns on the guarding islands. The Initial Tractor Group of the Northern Attack Force (Captain Armand J. Robertson, Commander), containing nine LSTs, carried the essential amtracs for the assault landings on the off-lying islands south from Roi-Namur. While in Hawaii they were at Nawiliwili Bay in the northwestern island of Kauai, separated by 100 miles from their Task Force Commander. Upon arrival from San Diego late on 17 January, they had been reluctantly positioned at Nawiliwili Bay because of lack of berthing space in the Pearl Harbor area, the available Pearl Harbor berthing space being preempted by the larger amphibious ships of the Northern Attack Force and by all the ships and landing craft of the Southern Attack Force. Marshalls. Since the LSTs departed Hawaii before the TF 53 main body, there was to be no opportunity for a discussion of the orders with CTF 53 or his Staff before implementing them. The primary task of the Initial Tractor Group was to establish a regiment of Marine artillery on the four designated small islands within artillery range of all of Roi and Namur. The assault plan for the initial assault on the small islands to the south and west of Roi and the south and east of Namur followed the GALVANIC pattern of transferring the Marines via LCVP's from the large transports directly to the amtracs just launched from the nine LSTs. This pattern creates problems when carried out during darkness. The amtracs, as soon as launched in the dark of the night, were under orders to assemble close aboard the LSTs from which they were launched to receive the assault troops from the transports arriving in the nearby Transport Area about 0500. 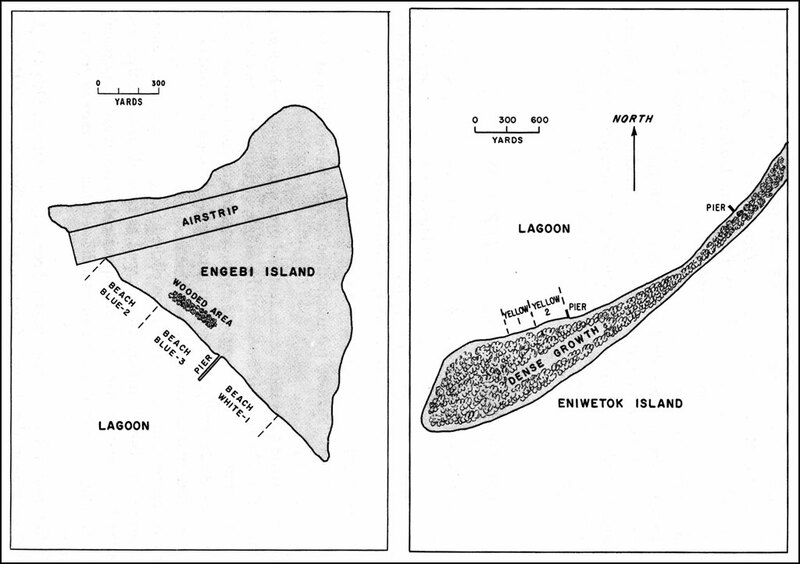 Landing Plan for IVAN and JACOB Islands, Kwajalein Atoll. 26 (Captain A.D. Blackledge) with a combat landing team from the 25th Marines embarked. The LSTs were from the newly formed LST Flotilla 13 (Captain A.J. Robertson). The Line of Departure was five thousand yards from IVAN and JACOB Islands. The Transport Area was five miles westward from the Line of Departure (see chart, page 805). The Phelps (DD-360), carrying of primary boat control officer, Captain E.B. McLean, was at the Line of Departure. It is the decision of this Command to arrive at the LST Area at 0345, 31 January, to accord an interval of 5 hours and 15 minutes prior to the hour of attack. . . . In this connection, it should be noted that the rated capacity of the LST elevators which would lower the amtracs from the main decks to the tank deck was 22,400 pounds. The amtracs with armor protection weighed 25,400 pounds, so the elevators would be operating at better than ten percent overload. How long they would stand up under this overload, and the problems which then might arise, were anybody's guess. Because of wind and current, considerable difficulty was experienced in keeping LSTs in proper position in assigned area. The necessity of keeping LVTs close aboard until arrival of assault troops from transports added to the difficulty. northeast. (The Appalachian logged 19 knots from 056° at 0530.) The goodly swell which ran three to four feet was having its top whipped off and onto those manning or riding the landing craft. The day was overcast and there were rain squalls. The first islands to be seized were IVAN (Mellu) and JACOB (Ennuebing) southwest of Roi Island. Since these islands had no visible life on them, they were shelled at a distance of only 2,000-3,000 yards by destroyers beginning "with the arrival of good light at about 0645" and at even closer ranges by the fire support LCI's.6 Additionally, they were bombed by carrier aircraft before the landings. Later it was learned that there was no defensive Japanese armament larger than a light machine gun on these islands although the Phelps in her Action Report "observed enemy battery in area 910 (JACOB), Ennuebing. Took it under fire, and scored direct hits." There was no visible response to the initial gun and bomb attacks. on southerly IVAN on the opposite side of the island from Beach Blue Two, although the Marine's history of the Marshalls' operation indicates this occurred at 0955. The problem at southerly IVAN was not a minor one. One of the leading tractors headed for IVAN's Blue Beach Two capsized in the rough surf. Perhaps this was due to its grounding on a large coral head or other irregularity of the beach approach just as a roller hit the tractor. Sensibly, the amtrac movement was halted after this casualty and, in time, the lead waves diverted to Mellu Pass south of IVAN and thence on to the calmer waters of the lagoon beaches of IVAN. This all took time and makes a 0955 landing seem impracticable. The following TBS messages originated principally by the Air Observer or Air Coordinator and logged at the time tell the interesting story of the landings on IVAN. 0932. 3 LCI approaching Beach Blue 2. 1,000 yards from Beach Blue 2. 0936. CTF 53 to COMFIRESUPPORT Unit Five (Captain McLean in Phelps) What is delaying IVAN attack? 0937. LCI's delivering very accurate results on Beach Blue Two. 0938. Fighters now strafing Beach Blue Two. We are at 100 foot altitude. 0942. Air Coordinator reports [boats] are not yet on beach of IVAN and he is waiting before strafing. 0949. LCI's still firing on Beach Blue Two at approximately 800 yards offshore. LVT and LVT(2) have made no attempt as yet to head for Beach Blue Two. 1003. Fighters are now strafing Beach Blue Two. 17 LVT(A)'s standing off beach at IVAN. 1008. There is one LVT which is upside down completely capsized approximately 100 yards Northwest off Beach Blue Two. 1010. Air Coordinator reports first wave of boats have beached on IVAN Island and some have shoved off again. 5 LVT(2)'s standing off Beach Blue Two at approximately 200 yards. Are heading toward beach. Seem to be floating around in areas of LVTs. Approximately 50-100 yards off Beach Blue Two. Crew of capsized tractor appear to be having no trouble and are wading in toward beach. This Air Coordinator report was soon corrected by the Air Observer. 1015. No boats have landed on Beach Blue Two. Am at altitude of 30 feet 100 yards offshore. Boats are approximately 200 yards to the Northwest and 5 LVTs approximately 100 yards off the beach at the south. 1026. Another LVT(A) has gone in on northwest side of IVAN and has picked up crew of capsized LVT. This LVT appears to be having no trouble at all with the surf. 1034. 4 LVT(2) in uniform wave landed on South Beach of IVAN. 1038. Second wave of LVT(2) landing on South Beach of IVAN. Many of the 19 Japanese on IVAN and the 16 Japanese on JACOB chose the easy way out by committing suicide. Others fought bravely against overwhelming force. Best of all, two prisoners were taken on IVAN and three on JACOB. JACOB was reported secured by 1042 and IVAN by 1145. As soon as JACOB Island which guarded North Pass was secured, minesweepers proceeded into the lagoon through North Pass and swept the approaches to the important lagoon beaches on Roi-Namur and the anchorage area for the large transports. This should have tipped off the Japanese as to the beaches where the assault on Roi-Namur would take place. The minesweepers warned the Phelps that there was only 15 feet of water in North Pass, so the Phelps and other destroyers used Mellu Pass. The minesweepers also alerted all the amphibians that the lagoon had numerous coral heads to plague them. Able Hour, the time for amtrac touch down on ALLEN and ALBERT Islands southeast of Namur, was planned for 1130. Baker Hour, the time for the last assault landing on Dog Day was planned for 1600 at ABRAHAM Island. ABRAHAM Island was only 450 yards southeast from Namur. With these islands in our possession, Marine artillery could be emplaced to provide close gunfire support during and after the assault landing, as well as deny to the Japanese the opportunity to harass from the flank the assault waves going into Roi-Namur on Dog Day plus one. The basic plan called for the eastern island landings at Able Hour (1130) to use both (1) the amtracs which carried the Reserve for the IVAN and JACOB landings and (2) the amtracs released by the IVAN and JACOB Landing Teams after their landing task was completed. Because the initial western island landings ran up to 90 minutes behind the original schedule and because the amtracs again would have to buck the easterly trade wind sea for even longer distances (7-8 miles) to reach ALLEN and ALBERT further to the eastward, it was a certainty that it would be midafternoon before these important Dog Day landings would take place. This meant that some of the Marines participating would have been afloat in the uncomfortable long trade wind ground swells since before sunrise. Necessarily, the Reserve for IVAN and JACOB had been boated right after the initial assault waves. Not only did stomachs have to contend with the swell, but the men and their equipment were continuously wet down by spray whipped off the crests of the swell by the healthy breeze. Regassing of the amtracs was planned after the initial assault on IVAN (Mellu) and JACOB (Ennuebing) Islands, and prior to the assault on the eastern group of small islands southeast of Namur. This precaution was born of the experience at Tarawa, where numerous amtracs had reported themselves out of gas at a critical moment after the initial assault landing. About 1156 the Phelps was directed by Rear Admiral Conolly to enter the lagoon via Mellu (IVAN) Pass, rather than via North (JACOB) Pass, because of the 15-foot depth limitation reported by the minesweepers. Since these contingencies did not arise, LCC-33 proceeded to take position in the center of the Line of Departure for ALBERT which was within the lagoon and her next assigned station. Naval Personnel. Hence her side of the unhappy story of the next several hours remains untold. Am going to support mine sweepers. Take over. Brigadier General Underhill's reports indicate that he was plenty unhappy about this turn of events.14 The SC-997 at best could cover only four radio circuits versus twelve in the Phelps. Several of her radio circuits developed troubles. Further, LVT Transfer Areas One and Two were not marked by buoys and there was no provision in the orders of Commander Initial Transport Group (CTG 53.9), Captain A.D. Blackledge, for this marking. So the Phase Two amtracs had no fixed marker to rally around when they finished their chores at IVAN and JACOB. These two conditions led to a rapidly developing lack of control and concentration of the amtracs. To make matters worse, most of the amtracs in the Transfer Areas set off to follow the Phelps into the lagoon via Mellu Pass, because they knew that Phelps was to mark the Line of Departure for ALBERT and ALLEN. Other amtracs needing gas had to push on westward all the way to the LSTs to pick up this important fuel and were not always able to get it from the first LST they reached and asked for it. Amtracs were going every which way, largely in accordance with the individual judgments of the Marines who were driving the vehicles. The SC-997 cruised here and there and gradually rounded up the majority of the amtracs. CTF 53 and the Fourth Marine Division both logged the first organized wave of amtracs as passing through North Pass en route to the Line of Departure at 1305, or just after the Phelps had moved through Mellu Pass. At 1315 CTF 53 retarded Able Hour from 1130 to 1430. During all these hours, the destroyers of the Northern Support Group, and the aircraft from the support carriers had shelled and bombed, and reshelled and rebombed ALBERT and ALLEN. In addition, the fire support LCI's firing rockets and the tank-type amtracs prepared the beaches at close ranges by vigorous rocket and gunfire. Despite all this, a small number of Japanese were still alive and fighting when the Marines moved ashore. Thirty-four Japanese had to be killed before the two islands were reported secured. Moving smartly to the northward, the Marines seized ABRAHAM Island just before sunset against modest resistance from the six Japanese defending it. ANDREW Island, just south of ALLEN Island, had been secured earlier, and at 1915, the Dog Day assault landings were over with all objectives secured. 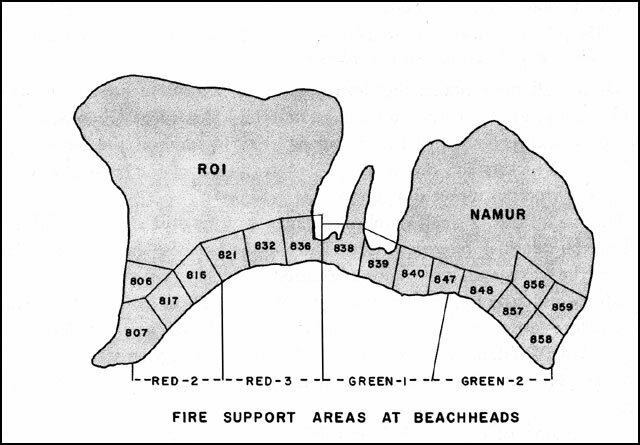 Four battalion landing teams, two on Roi and two on Namur, were to be landed simultaneously. One battalion landing team of each regiment was to be held in reserve. no firing was observed from Japanese coast defenses, this was target shooting at its best. The Japanese made one futile attempt to wheel into place and use a medium caliber field piece. Roi-Namur had been subjected to a day-long bombing attack on 29 January 1944 by the planes of Task Force 58. Air strikes were again carried out by the Carrier Force commencing at dawn on 30 January. However, heavy explosions and large fires on Namur from the pinpointed gun bombardment during the next two days, indicated that large storages of fuel and ammunition had not been previously destroyed by either guns or bombs. Approximately 25,000 shells of all sizes were fired by the Shore Bombardment Units of the Northern Attack Force, during all phases of the assault operation. This was an essential decision, as may be seen from the report of the LST Flotilla Commander. LSTs without welding machines were unable to repair several LVTs. . . . Many assault troops lacked transportation because of the shortage of LVT2s. To meet this situation, every LCVP in the vicinity was commandeered and loaded with assault troops and dispatched to the Line of Departure. . . . At about 0800 empty LVT2s singly and in groups of 3 to 10 without [adequate] gas, started coming back from the Islands where they had spent the night. Many of these tractors, according to plan, should have returned to the LSTs the night before. . . .
adequate, pin-pointed gun and air bombardment on the assault beaches (Red 2 and Red 3 on Roi Island, and Green 1 and Green 2 on Namur). At 0822 Colander Northern Attack Force confirmed this hour, but again the Navy did not even come close to putting the Marines ashore at the chosen time. At 0853, as it became evident that amtracs for the assault waves were in short supply, CTF 53 delayed William Hour until 1100, but it was not until 1112 that the Phelps shoved off the initial wave of amtracs for Roi and Namur. This short supply occurred despite the 340 amtracs available on Dog Day to the Marines, twice the number available in the Southern Attack Force. In re-embarking on LSTs, six of my tractors were led out to sea by the guide boat. Three of them got aboard LST-271, three ran out of gas, and sank. One of my tractors was held there [at ALBERT] and not released until the night of D plus one day. One tractor was damaged while disembarking and was unable to participate in said landing. It was later sunk when the LST attempted to tow it. I lost one LVT due to a faulty bilge pump. This tractor went down just 100 yards off the LST. an adequate seaman's bow during the night to the strong westerly set of the current in the vicinity of Kwajalein Atoll. These LSTs had contrived a simple but time-consuming arrangement to get their amtracs from the main deck to the tank deck in order to overcome a design stupidity in the amtracs which were longer than the elevator opening on the ship. By running these amtracs up an improvised steep wooden incline on the elevator, their horizontal length was shortened, and the overloaded elevator could be lowered to the tank deck. This canting operation required exact positioning of the amtrac, and was not always accomplished at the first or second try. Despite the late morning return of the LSTs and their cautious choice of an anchorage well to the rear of the Line of Departure, the 23rd Marines reached that line at 1045. The 24th Marines were not so lucky, and a fair share of them had to be embarked in LCVP's instead of amtracs. It was another half hour before the 24th Marines could actually start for Namur, three minutes behind the eager beavers of the 23rd Marines headed for Roi. 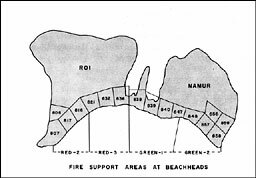 In fact, although touch down on Roi at 1157 was nearly two hours later than originally planned, the movement to the Red beaches had moved along reasonably well after the tardy LSTs under Captain J. S. Lillard had put their amtracs in the water. The supporting LCI gunboats, and the tank-type amtracs did their assigned chores very well, as did the support aircraft, the offshore gun support ships and the Marines' artillery. While this condition did not hold true for all of Roi Island, nevertheless Marine tanks reached the northeast corner of Roi about 1338 and by 1800 the island was in Marine possession. The Fifth Amphibious Corps logged Roi secured at 0800, 2 February. At 1930 on 10 February the first successful landing on the repaired and refurbished Roi airstrip was made by a Navy PB-4Y. act that the Commanding Officer 24th Marines had requested a further delay of William Hour to 1200, or, better yet, to leave the Line of Departure at 1200 for the 33-minute run to the beach. This delay was not granted but it was nearly 1200 when the landings on Green Beach One and Two actually took place. The lack of opposition on the Green beaches of Namur was similar to the enemy's lack of resistance at the Red beaches of Roi, but the Namur assault did not carry forward with similar momentum. The primary reason in the early moments of the assault landing was that the armored amtracs continued to fire just over the heads of the assault troops, making it dangerous to advance rapidly. Lesser reasons included an anti-tank ditch which delayed the forward movement of the amtracs and a really horrendous explosion about 1305 of a torpedo store house chock full of torpedo warheads in the path of the advancing troops on the right flank. Many casualties to our advancing troops resulted from this explosion. Two lesser explosions in the same area followed. The Japanese opposition inland on Namur was given time by these occurrences to recover their senses, if not to regroup and reorganize. They took advantage of a generous supply of natural obstacles and made the Marine task a difficult and time-consuming one, despite the fact that all senior Japanese officers had been killed either on Dog Day or early on Dog Day plus one by the ferocious air bombing and gun bombardment. Marine waiting to advance on Green Beach Two, 2 February 1944. However, the Commanding General, Fourth Marines came ashore shortly after 1700 and assumed command ashore at 0925 on Dog Day plus two (2 February 1944). By 1418 on that day Namur was secured and so reported by Major General Schmidt. A Japanese communique issued soon after Kwajalein was captured stated that the Japanese Army and Navy garrisons there totaled 4,500 and that there were 2,000 civilians. It added that they all died defending the atoll. This latter part was not quite correct, since 130 Japanese and 167 Koreans were made prisoners. Northern and the Southern Attack Forces indicates that, amphibiously, both the more battle-experienced transports and troops were assigned to the Southern Attack Force. The Northern Attack Force had a troop unit--the Fourth Marine Division--which had not been battle tested. The transports, the LSTs, and the smaller amphibious units of the Northern Attack Force were largely doing their first amphibious combat operation, although there were some experienced amphibians, among them Captain Pat Buchanan, Commander Transports, and Commanders J.B. McVey and L.F. Brown (USNR), Commanding Officers Alcyone and William P. Biddle respectively. However, the Northern Attack Force was blessed with a fully experienced Commander. Some of the amtrac and LCVP boat wave problems which arose in the Northern Attack Force are traceable directly to the inexperience of boat wave commanders and of amtrac drivers. It is ever thus in war that inexperience must pay its penalties. The crux of the overall situation was limited time. It would have been desirable to move the Fourth Marine Division from Californian waters to Hawaii and then to transfer it to the experienced amphibious ships just back from the Gilbert Islands operation. But this step plus the time for a rehearsal in Hawaii would have required delaying FLINTLOCK no less than two weeks. A single extra week did not exist in the JCS operational time schedules, nor in Admiral King's thinking. So, an inexperienced amphibious group had the difficult chore of establishing ashore an inexperienced Marine division. There were problems, but there also was great success. It is worth noting here that while, at the amtrac and landing craft level in the Northern Attack Force, communications had been a major Dog Day stumbling block due to grounding out of amtrac and boat radios, Commander Northern Attack Force found no fault with his 71-page communication plan or with its execution. He reported: "Communications were generally excellent." Bug, First Class" during the Gilbert Island operation, when several destroyers scraped coral heads. It really became a military hazard at Kwajalein Atoll, when the following ships and craft of the Northern Attack Force ran badly afoul of unsuspected and uncharted coral heads: Anderson (DD-411), Remly (DD-688), Young America (XAP), Chief (AM-315), LCI-450, YMS-320 and LCT-576. The damage to the Anderson and to LCI-450 was so severe that they had to be towed back to Pearl Harbor for repairs. 4 February. Lindenwald arrived from Kwajalein to load amphibious tractors for SOPAC [4th Amphibian Tractor Battalion, 1st Armored Amphibian Battalion]. 5 February. CTF 53 shifted flag to Maryland. 6 February. Battleships, Cruisers and Destroyers of TF 53 . . . (Rear Admiral Oldendorf OTC) departed for Majuro for fuel, provisions and ammunition. Maryland transferred all 16" and 5" bombardment ammunition to Colorado prior latter's departure. On 26 October 1943, CINCPAC had informed COMINCH that operations for control of Eniwetok Atoll would be undertaken simultaneously with the operations to seize the other main islands in the Marshalls. But when it came right down to the difficult planning of what resources were available to do the landing, CINCPAC was constrained by the practicalities to set the day for the assault on Eniwetok as 10 May 1944. Just after GALVANIC, this date was advanced by CINCPAC to 19 March 1944. The assault actually took place on 17 February 1944. 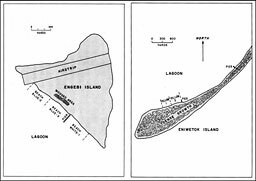 The primary objectives in seizing Eniwetok were to provide a naval base for our further advance to the westward and to deny the use of the atoll to the enemy, who were using it primarily to stage aircraft to the central and eastern Marshalls. Once held by our forces, the Japanese would find it cumbersome and time-consuming to ferry land planes into Wake and into the bypassed atolls in the Marshalls, via the longer route through Truk and Kusaie. The great desirability of owning Eniwetok Atoll as a springboard for an amphibious operation against the Caroline Islands or the Marianas was apparent from their locations on the charts. Eniwetok Atoll was only 670 miles from Truk, the 'Pearl of the Carolines,' and just over 1,000 miles from Guam in the Marianas. Eniwetok Atoll was a nearly circular atoll--about 20 miles across--with more than 30 islands supporting underbrush and coconut trees, mostly along the north and southeastern side of the coral rim. The large lagoon of 388 square miles inside the relatively high coral islands was the best large anchorage in the Marshalls and had been used frequently by the Japanese Fleet. It lay about 330 miles northwest from the airfield on Kwajalein Island. like an upside down teardrop, marked the southern side of the easterly Deep Entrance into the lagoon. Eniwetok, the largest island, two and a half miles long and shaped like a marlin spike, marked the eastern side of Wide Passage, the southerly entrance to the lagoon. There was a 4,000-foot Japanese airstrip on Engebi that was completed in July 1943. It was readily apparent that the longer the Eniwetok Atoll operation was delayed after the eastern Marshalls had been assaulted, the more troop reinforcements coming in from the Japanese homeland would be on the beaches of the islands of the Eniwetok Atoll to greet our Marines and soldiers. Only 800 Japanese troops were estimated in mid-January 1944 to be at Eniwetok. The planning factor for troops required for an amphibious operation called for a superiority of the attacking forces of 4 or 5 to 1. If the Japanese had 1,000 defensive troops on Eniwetok Atoll, we needed 5, 000 assault troops. If they had 5,000 defensive troops, we needed 25,000 assault troops, a major amphibious operations Hence, speed was of the essence. The big problem was whether the necessary air and big gun resources could be assembled and used successfully in the sparse days available before they had to be sent out of the area to the South Pacific. Operations for carrier strikes against Truk (24 March) and against more remote Kavieng on New Ireland Island (1 April) in the Southwest Pacific were on the JCS check-off list following FLINTLOCK. They had the priority call on available heavy-gun combatant ships as well as carriers. The JCS directive requiring the sending of the new battleships to the Southwest Pacific for the Kavieng operation was particularly troublesome. Japanese air strength on Ponape in the Carolines, only 370 miles southwest of Eniwetok, and on Kusaie about 420 miles due south of Eniwetok Atoll, would need a lot of post-FLINTLOCK attention to reduce the air attack worry factor at Eniwetok. Ships and planes required for and in support of the CATCHPOLE Operation could not double in brass at the same time in the faraway Southwest Pacific. Rear Admiral Turner must have warmed the cockles of his seniors' hearts when they read in his despatch that he was proceeding with urgent plans for the accomplishment of CATCHPOLE in advance of approval by his seniors to undertake this operation. Time was of the essence and the various time groups in the despatches being exchanged at the higher levels during this operational period indicated that it was taking four or more hours for an operational priority despatch to reach Pearl Harbor and Washington from the Marshalls. The day before I sailed from Pearl Harbor for the Marshall Operation, Admiral Nimitz had received the first aerial photograph of Eniwetok. When we had examined them, I said that I wished we could proceed with the capture of Eniwetok as soon as we had taken Kwajalein. This was not possible if the Fleet had to go to the South Pacific. Rear Admiral Harry W. Hill commanded the Eniwetok Expeditionary Group, charged with the capture and occupation of Eniwetok Atoll. Brigadier General T, E. Watson, USMC, was in command of the Expeditionary Troops and the Eniwetok Landing Force. Rear Admiral Hill proceeded from Majuro Atoll to Kwajalein Atoll via plane on 3 February and commenced drafting his plans. The amphibious part of the Eniwetok Expeditionary Group consisted of five attack transports, one transport, two attack cargo ships, one cargo ship, two high speed destroyer-type transports, one dock landing ship and nine LSTs. Ten destroyers were told off as the transport screen and three minesweepers to sweep up any Japanese mines. Gunfire support was provided by three old battleships, three heavy cruisers, and seven destroyers. The latter also acted as anti-submarine screen for the larger fire support ships. To provide close air support, there were three jeep carriers screened by three destroyers. One group of the Carrier Forces containing one large carrier, two cruiser-hulled carriers with two heavy cruisers and one anti-aircraft cruiser with eight destroyers to provide generous anti-aircraft and antisubmarine protection completed the Expeditionary Group. The operational planning period of the next six days was hectic but on 9 February, Rear Admiral Hill issued his Attack Order A106-44, and with very minor corrections, the 182-page order stood up. Admiral Nimitz had flown out to Kwajalein on 4-5 February and during the next two days gave his approval to the general aspects of the plan which had been developed by the senior officers concerned for assaulting Eniwetok Atoll. It is noted here that CATCHPOLE was the only major amphibious operation of the Central Pacific campaign where the operational planning period was less than a week. Further, as a result of our seizure of the heart of the Marshalls (Kwajalein), the Japanese Combined Fleet left Truk on 3 February 1944 and retreated to Palau Islands more than a thousand miles to the westward of Truk. This was a major victory for the Pacific Fleet, not immediately known to us. Therefore it was not a basis for the operational planning of CATCHPOLE and not shouted about in the public press. Eniwetok is not strongly defended. possibility that some portion of the 1st Mobile Shipborne Force of 2,000 to 3,000 Army troops may be in the area. This was the sad reality. Way back in JICPOA at Pearl, an estimate of 2,900 to 4,000 Japanese troops on Eniwetok Atoll was issued on February 10th, the day after CTG 51.11 had issued his plan. Photographic intelligence was interpreted to indicate that the major portions of these troops were on Engebi Island, and that Parry and Eniwetok were lightly held. The actuality was that there were nearly 3,000 troops, 500 other military personnel, and several hundred Koreans on the Atoll, and that each of these three islands had a fair share of the total Japanese strength. to Kwajalein and eastern Marshall atolls. There were 2,586 troops of the Brigade remaining at Eniwetok Atoll. Some 20 to 120 of 150 grounded pilots and airmen who had been flown out of the eastern Marshalls had the bad luck to still be on Eniwetok Atoll when our amphibious forces arrived. Major General Nishida probably did the best he could with what he had during the six weeks he was on Eniwetok, but the defensive installations on Eniwetok Atoll had major deficiencies when compared with Kwajalein Atoll, even though they were better camouflaged. There were practically no strong concrete defensive structures, the defense being centered around foxholes and trenches. Luckily for us, also, there were no beach mines nor underwater obstacles in the lagoon beach approaches. The beach mines had arrived at Eniwetok Atoll but were in a dump. There were only random anti-tank land mines inland. Two 4.7-inch ex-British coastal defense guns had long been mounted in earth works at the northern extremity of Engebi Island. These were the only coast defense guns in the atoll. Our success in the Eniwetok operation was to be facilitated by bombing and strafing attacks by carrier aircraft at frequent intervals during the ten days prior to 17 February--Dog Day for CATCHPOLE. And a large scale strike by the Task Force 58 (nine carriers) against the Japanese "Rock of Gibraltar," Truk Atoll in the Carolines, on 17 February was planned. Hopefully it would send the Japanese Combined Fleet scurrying westward and drastically reduce the Japanese aircraft available for interference with our forces assaulting Eniwetok Atoll. Unfortunately, the first of these objectives had been undertaken by the Japanese two weeks before. As has been mentioned before, the three main Japanese occupied islands of Eniwetok Atoll were Engebi at the northern extremity and Parry and Eniwetok at the southeast. 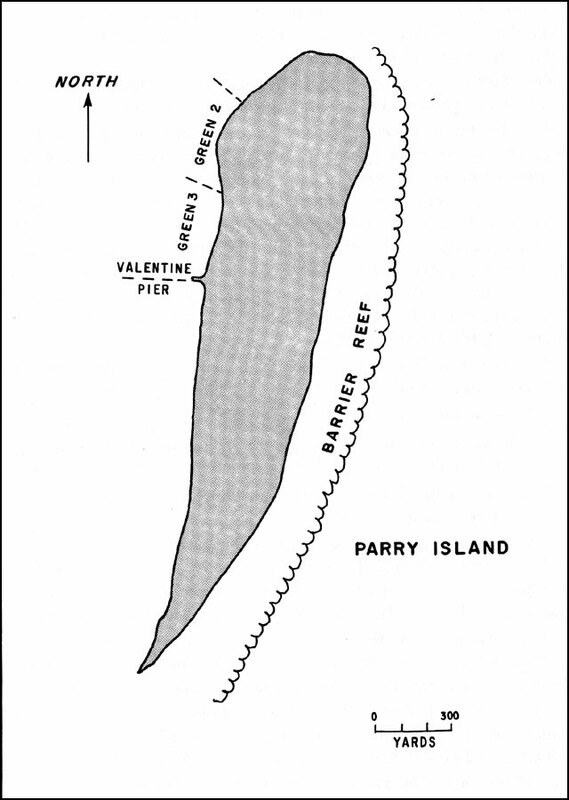 Deep Entrance was just north of Parry Island and Wide Passage just to the westward of Eniwetok Island. A single runway airfield was located on Engebi Island. In carrying out this general Scheme of Maneuver, one small island to the west of Engebi and five small islands to the south of Engebi were to be seized on Dog Day. Artillery was to be emplaced on two of the islands to the south of Engebi. On Dog Day plus one, Engebi was to be assaulted by two battalions of the Marine 22nd Regiment. On Dog Day plus XRAY, Eniwetok was to be assaulted, and if only one battalion was judged necessary for the assault, Parry Island would be assaulted the same day. If two battalions were required, then Parry would be assaulted later. XRAY would be two, three, or more days depending on when the capture of Engebi had been attained. Eniwetok was to be assaulted by the 106th Infantry Regiment, and Parry by the troops most available, possibly one battalion of the 106th and one battalion of Marines. In drafting this detailed plan, it was necessary to keep in mind that the Reserve Force Landing Group, while it had carried out landing exercises, had neither trained nor rehearsed for an assault landing--much less for one on Eniwetok Atoll. After a final conference of all Flag and Commanding Officers on 14 February, in lieu of a rehearsal, Rear Admiral Hill's Task Group sortied from Kwajalein on 15 February 1944. The tail-enders of his ships had arrived there only on 13 February. LSTs 268, 43, and 45 were beached at Roi Island unloading cargo from transports. LST-45 had a load of 2,000 pound bombs and depth charges. Alongside the LSTs were LCTs 346 and 347 also unloading small arms ammunition.
. . . The supply compound was nearly destroyed, one of the ammunition dumps was blown up. . . . Eighty-five percent of all Island supplies ashore were destroyed. The first bombs were incendiary, immediately starting many oil and ammunition fires. Pieces of incendiary and phosphorus shells fell on and alongside the three LSTs momentarily starting small fires on deck. . . .
During CATCHPOLE the trade wind continued to blow 17 to 23 knots (according to CTG 51.11 despatch reports) and there were occasional heavy showers, but, except for a drizzle on Dog Day plus one, by and large there was good weather. As a further assist, a Japanese chart of Eniwetok lagoon showing dragged areas free of coral pinnacles was available among the loot captured at Kwajalein Atoll on Dog Day. The gun bombardment at Eniwetok Atoll began on schedule at 0700 on Dog Day and proceeded uninterrupted by any return fire from the outgunned Japanese. A mine swept up about 0822 by the Sage (AM-111), inside the lagoon north of Wide Passage, delayed the initial lagoon movement (by the transports) towards Engebi Island. Altogether 27 moored mines were swept in Eniwetok lagoon. Despite this, by 1034 all amphibious ships and craft were inside the lagoon. All did not go too well, however, during the lagoon approach to northerly Rujiyoru and Aitsu Islands where reconnaissance troops were to be landed to clear the way for the Marine artillery which was to be landed and sited. The task unit guide, SC-1066, failed to identify Rujiyoru Island correctly and led the anxious ships to the wrong position. It took a bit of doing before the reconnaissance parties landed on the correct two islets. The artillery moved a bit slowly in getting ashore, but by 1530 the artillery had been landed unopposed and before sunset was firing on Engebi Island from Rujiyoru and CAMELLIA Islands (Aitsu), to the southeast of Engebi Island. The guns fired harassing fire all night. The Beach Reconnaissance Party, closely supported by battleships, cruisers, and LCI gunboats, took a close look at the beaches of Engebi Island, buoyed shoal spots, marked boat lanes, and saw no mines. Left: Engebi Island showing landing beaches. Right: Yellow beaches of Eniwetok Island. Once again, on 18 February 1944, at Engebi Island, Eniwetok Atoll, the Navy landed the Marines on time and in fact, two or three minutes ahead of William Hour which was set for 0845. During the landing operations all went well. Even the trade wind veered a bit to the east and kept the bombardment dust clear of the boat lanes. Commander Air Support Eniwetok reported that there were no calls for air support at Engebi. A vigorous offensive by the Marines, and the landing of the Reserve Battalion, secured Engebi by 1640 on Dog Day, but mopping up operations continued throughout Dog Day plus one. Valuable Japanese code books were captured. Actually some 780 Japanese troops of the 1st Amphibious Brigade were on Eniwetok Island. 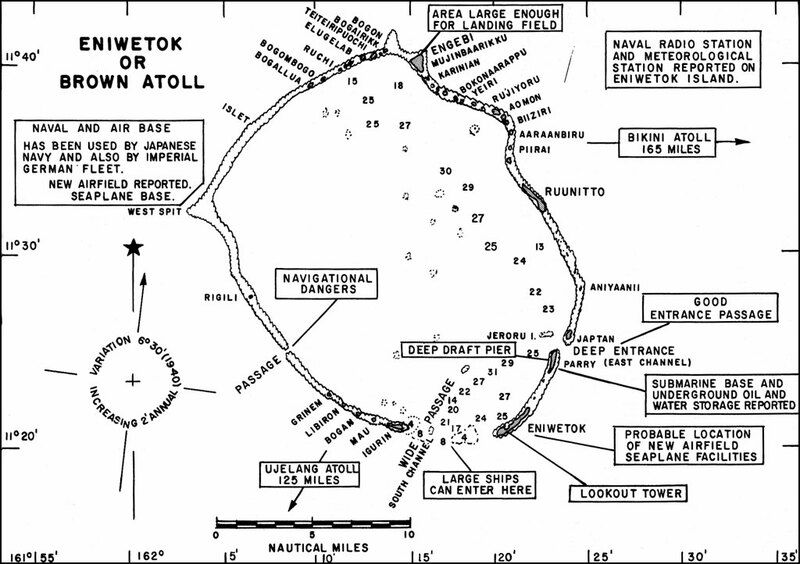 Eniwetok Island's elevation of ten feet and over was one of the highest in the Marshalls. The coconut trees and the jungle undergrowth were dense. Japanese foxholes were extremely deep, interconnected and covered with coconut logs. Additionally, there were concrete pill boxes, immobilized tanks, wire barricades, and determined fighting men. 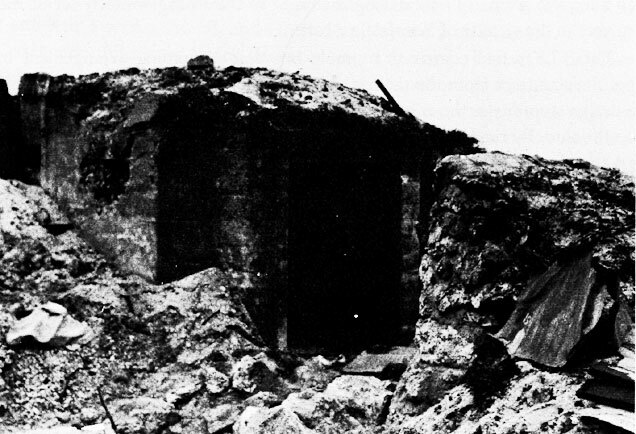 It was apparent from the information elicited from the Japanese prisoners taken on Engebi Island on Dog Day, as well as from Rujiyoru natives and captured Japanese documents, that the Japanese defenses must be extremely well camouflaged, since all three sources indicated they did exist in generous quantity. A series of squalls struck the area at this time. . . .
calling on the Reserve, the 22nd Marines, who had taken Engebi the day before. The first wave of Marines from the Reserves left the Line of Departure at 1315. Eniwetok Island was not secured until Dog Day plus four (February 21st). Because of the nature of the island, naval gunfire and close air support played only a sporadic part in the three days of fighting. According to Rear Admiral Harry Hill's report, the attack was postponed to permit rehabilitation and reorganization of personnel and equipment and to allow additional time for air and surface bombardment of Parry. 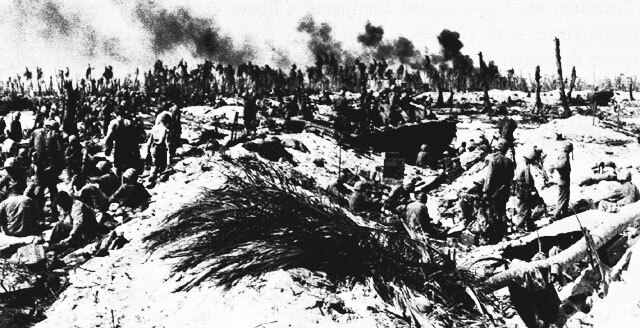 Newly found targets had been made visible by the blasting away of Parry Island foliage during the air and gun bombardments of the previous day. tonnage was added to the initial gun bombardment along with the air bombardment, Parry Island was really mauled with much of its heavy foliage stripped away and damage inflicted on all above ground installations and to some of the network of underground entrenchments. A further major change of plans was made, substituting the 22nd Marine Regiment for the 106th Infantry Regiment for the assault on Parry, since the majority of the latter were still busy on Eniwetok. Two Marine Battalion Landing Teams would make the assault, with the Third Marine Battalion Landing Team, initially in the Regimental Reserve, but scheduled to land on order and participate in the fight to capture the southern part of Parry Island. One makeshift Provisional Battalion from the 10th Marine Defense Battalion, just arrived at Eniwetok Atoll on 21 February as part of the Garrison Force, and one Battalion Landing Team from the 106th Infantry Regiment, would form the Task Group Reserve. Artillery emplaced on Japan Island to the north and on the eastern end of Eniwetok Island to the southwest provided artillery support. A very last minute change in Marine landing plans shortened and shifted the landing beach area. Additionally, the destroyer Hailey mistakenly fired upon three LCI(G) supporting the landing approach, resulting in heavy personnel losses to these newly created gunboats. Commander LCI(L) Division 15 reported that the smoke from the shore bombardment, blowing down towards the boat waves reduced the visibility to 400 yards and produced a navigational problem for the assault. The Marines moved steadily forward and, despite some land mines, blasted out the Japanese spiderweb defensive systems with grenades, flame throwers, and demolition charges. One troop-support close-gunfire mission was requested. This was refused by the Commander Headquarters Support Aircraft, Captain Richard F. Whitehead, believing that friendly troops were too close to the target designated. When the upper echelons of command were bypassed with a second request on another radio circuit, and the gunfire provided, Marine casualties occurred. By nightfall all but 450 yards at the southern end of Parry had been overrun. 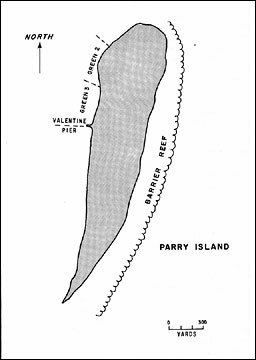 Large-scale star shell illumination was maintained over Parry Island throughout the night of 22-23 February, the first such extended continued large-scale use in the Pacific amphibious campaigns. Mopping up operations on Parry were completed on 23 February, Dog plus six, and the Eniwetok Operation was officially over. By 27 February 1944, Navy planes were operating from Engebi Airstrip. Back-up logistic support for the advancing amphibious forces was also moving forward in the Pacific. The establishment of Service Squadron Four in Funafuti in the Ellice Islands was followed by the establishment of Service Squadron Ten in Majuro. With this latter move our mobile logistical support was 2,000 miles closer to Japan than at Pearl Harbor. Eniwetok Atoll had been secured with the loss of 348 dead and 866 wounded. The majority were Marines who fought on all three islands and on every day of the period, 17-23 February. Sixty-six prisoners were captured, 2,665 Japanese were reported buried by our forces but since some 3,400 Japanese were on the atoll, the rest must have been buried by the heavy air and gun bombardments. An examination of the Japanese equipment and material at Eniwetok indicated that this atoll would have been a lot more difficult and costly to assault had the initial assault been long delayed. Many new and unmounted guns from 20-millimeter to 5- inch had recently been received at Eniwetok Atoll as well as large amounts of concrete, steel reinforcing rods and numerous land mines. 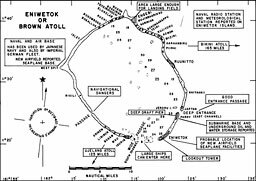 Eniwetok Atoll was in the process of becoming a tough nut to crack and the assault against it was conducted none too soon. No Japanese airplane was seen at Eniwetok Atoll during the whole assault phase. Careful and detailed rehearsals of scheduled attacks against defended positions are considered to be a most important feature of the preparation of assault forces for amphibious operations. . . . Elementary and basic amphibious training provide only for the improvement in technique of the individual, and of battalions or sometimes regiments. On the other hand, the assembly of a large amphibious attack force brings together numerous units of different arms and services which may never have operated together, or have had contact with each other. Since a very high degree of coordination is required for a successful assault, the activities of each of these elements must be carefully dovetailed with those of the numerous other previously unrelated elements. Personal cooperation between strangers is involved. The technique for determining underwater hydrography and obstacles in the beach approaches was highly successful. Close beach reconnaissance became a standard part of the pre-assault period. The need of a complete rehearsal and post-rehearsal critique and the advantages to be obtained therefrom were reaffirmed. Stressed was the necessity of the aircraft from the Fast Carrier Task Forces to participate in both of these events. The LVTs and DUKWs conclusively proved their value for landing across reefs. The DUKWs, a United States Army amphibious development, were introduced to Pacific Ocean amphibian warfare at Kwajalein. The LSTs and LCTs proved their great usefulness and versatility, although during secondary phases of the assault landings as was noted by one subordinate commander: "LCTs have a tendency to hole up somewhere" and enjoy life. A good deal of palletized cargo had to be broken down before sending it into the beaches in LVTs and DUKWs. The dropping of parachute flares by the air coordinator's plane from about 2,000 feet altitude, as a signal that the leading wave of amtracs was 500 yards from the beach and all naval gunfire artillery and air support should be shifted inland, worked well at all landings except at Parry Island. was changed at Kwajalein Atoll from the parallel approach to runs perpendicular to the track of the landing waves. This permitted the strafing to be conducted safely when the lead waves were only 300-500 yards from the beach, and was more effective. Early waves of assault troops should be aboard LSTs carrying amtracs prior to Dog Day in order to avoid delays incidental to the rendezvous of boats with the LVTs. Artillery could be successfully landed from DUKWs. Continuous star shells considerably reduced the number and effectiveness of Japanese night counterattacks. Logistic support bases in the forward areas, where LSTs could reload and carry major parts of the logistic load to the objective, were needed. The organization and training of island garrison forces must be undertaken before embarking them for islands taken from the Japanese. The new gunboats--LCI(G)'s--and their close fire support of the beach assault waves were an essential part of the landings. One of the minor favorable results of the FLINTLOCK Operation was the opportunity to examine a Japanese submarine found broken in two in Kwajalein Atoll and some of its torpedoes. According to the draft narrative history of the Amphibious Forces Pacific Fleet, 191 ships and landing craft took part in the initial GALVANIC Operations in November 1943, excluding the ships of the Submarine Force and Service Force which supported the operation but were not under the command of Rear Admiral Turner or Vice Admiral Spruance. Thirty five of these 191 were in Task Force 52 and 56 were in Task Force 53 which together as TF 54 were under Rear Admiral Turner's command. These 91 ships and landing craft carried 35,000 Joint Expeditionary Force troops. The Secretary of the Navy was in the Marshalls and his approval was obtained. It took a bit of doing at the Washington level to make this recommendation in regard to Rear Admiral Turner a reality. A look at the Congressional Record for February 1944 does not indicate when the nominations from the Navy Department for the promotion of Vice Admiral Spruance and Rear Admiral Turner reached the Senate. Presumably they both reached there on the same day. Admiral Spruance's nomination to be an admiral for temporary service was reported favorably by the Committee on Naval Affairs, headed by Senator Walsh of Massachusetts, on 15 February and was confirmed by the Senate on 16 February 1944. The Senate met on Thursday, 17 February, but took a recess over 18th, 19th, and 20th, and then met on the 21st only to recess over George Washington's Birthday until Thursday, 24 February 1944, when it met for only three minutes. On Friday, the 25th, Senator Walsh favorably reported the nomination of Rear Admiral Turner to the Senate. The Senate next met on the following Tuesday, and again on Thursday, 2 March, but took no action on this nomination. The following extract from the Congressional Record tells the story of Friday, 3 March 1944, when the Senate met again. The legislature clerk read the nomination for Rear Admiral Richmond K. Turner to be Vice Admiral in the Navy, for temporary service. Mr. Danaker. Mr. President, as I understand it, it is the purpose of the Senator from New Mexico shortly to move that the Senate take a recess until Tuesday. Mr. Hatch. That is true. Mr. Danaker. Mr. President, in view of the fact that several senators from the committee on Naval Affairs are necessarily absent, I respectfully ask that the Senator from New Mexico not press for action on this confirmation. There is no reflection whatsoever upon the individual nominee, I have not the slightest doubt that he is entitled in every respect to the promotion which has been suggested. to the nomination in making his request, I am glad to accede to the request of the Senator from Connecticut and ask that the nomination be passed over. Mr. Danaker. I should like to have it noted that there is no objection on my part to the nomination. On the following Tuesday, 7 March 1944, when the Senate was next in session, Senator Hill moved that the nomination of Rear Admiral Turner to Vice Admiral be confirmed. Senator White "hoped that the request of the Senator will be concurred in." And this concurrence was given. The travail was over. The Bureau of Naval Personnel notified Rear Admiral Turner that day. The written evidence unearthed by this researcher as to what went on behind the scenes in delaying favorable action on this nomination is near nil. Admiral Conolly told this scribe that he was in Washington at this time on leave, and was sent up to Capitol Hill in early March 1944 to talk to Senator Brewster of Maine who was a member of the Naval Affairs Committee about the promotion, and that Senator Brewster told him that a Congressman from Massachusetts, who had had a son killed at the Battle of Savo Island, was the major objector to the promotion. Rear Admiral Conolly arrived yesterday. He is scheduled to tell about Roi and Namur this morning. 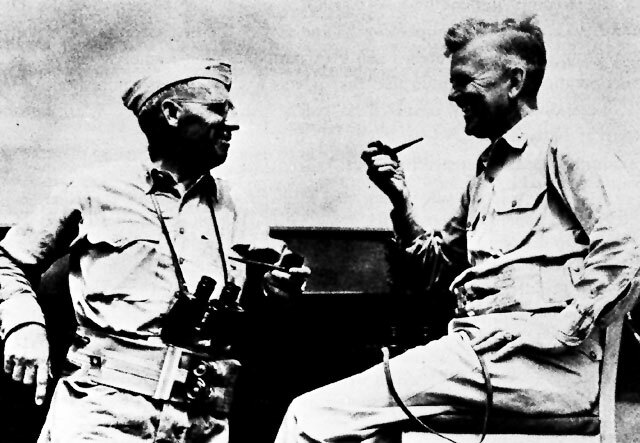 When Admiral Nimitz was questioned on the delay he replied that he had been told by, he thought, Vice Admiral Randall Jacobs, Chief of Naval Personnel, that the heavy Marine Corps losses at Tarawa had been raised as a major objection, coupled with Rear Admiral Turner's involvement in the Savo Island defeat. The facts of the matter are quite different. The only time General Smith had ever been two ranks senior to Admiral Turner since the two officers were both commissioned were two days in October 1941. Major General Smith won that rank on 1 October 1941 and Captain Turner was promoted to rear admiral (lower half) on 3 October 1941. General Smith was commissioned as a second lieutenant five years before Admiral Turner was commissioned an ensign. Despite this, in the 33 1/2 years that both had been commissioned, Turner had been senior to Smith in two ranks and for a period of nearly 15 years (7 December 1919 until 29 May 1934). The promotion went forward from COMINCH's office on 26 February and cleared the other echelons on 28 February, when it was so dated. On behalf of the entire Navy I send sincere congratulations to you and All Hands under your command on brilliant planning and outstanding accomplishments of recent campaigns. The country is proud of you all and confident of your continued successful progress westward. To: The Commander, Fifth Amphibious Force. 1. Upon the eve of his return to PEARL, the Commanding General, V Amphibious Corps, wishes to express his deep appreciation to the Commander, Fifth Amphibious Force, for the whole hearted and complete support given to the V Amphibious Corps in its capture of the KWAJALEIN Atoll. The successful termination of this operation was made possible by the full support of all units of the Force. 2. May it suffice to say that this Corps takes pride in serving under the Force, and with it behind us we would storm the very gates of Hell. 1. Interview with Admiral Richard L. Conolly, USN (Ret. ), 11 May 1961, together with letters of 13 Jan. 1961 and 4 May 1961. Hereafter Conolly. 2. Engineer V Amphibious Corps Study and Report of Japanese Defenses of Kwajalein Atoll, 4-10 Feb. 1944, 15 Feb. 1944. 3. COMLSTFLOT 13, War Diary, 19 Jan. 1944. 4. Ibid., 16 Jan. 1944. 5. (a) Ibid., 31 Jan. 1944; (b) COMTRANSDIV 26 FLINTLOCK Report. 6. Phelps (DD-360) and Johnston (DD-557) Action Reports, 7 Feb. 1944 and 3 Feb. 1944, respectively. 7. COMGENFIFTHPHIBCORPS, Report of 10th Amphibian Tractor Battalion, 12 Apr. 1944, Encl. (A), p. 1 to CO's report. 8. Ibid., Encl. (B), p. 1 of CO's report. 9. (a) CTF 53 FLINTLOCK Report, 23 Feb. 1944, Encls. (A) and (B), TBS Log; (b) COMDESRON One FLINTLOCK Report, 9 Feb. 1944; (c) Marine Monograph, The Marshalls, p. 44; (d) COMGENFOURTHMARDIV, Commander Northern Landing Force, FLINTLOCK Report, 17 Mar. 1944, Encl (c), IVAN Landing Group Report, p. 1. 10. CTF 53 Amphibious Attack Order A158-44 (Initial Landing), 8 Jan. 1944, Appendix 3, para. 3(e). 11. (a) COMINERON Two, FLINTLOCK Report, 12 Feb. 1944; (b) COMDESRON One Action Report, 23 Feb. 1944; (c) YMS-262 War Diary, Jan. 1944. 12. USS Phelps Ship's Log. 13. CTG 53.9 Amphibious Attack Order 1-44, 11 Jan. 1944, Annex B, paras 2, 5(b). 14. CGFOURTHMARDIV FLINTLOCK Report, Encl. (C), para. 9. 15. (a) Ibid., Encl. (C), and endorsements thereon; (b) Commanding Officer, 10th Amphibian Tractor Battalion FLINTLOCK Report, and endorsements thereon; (c) CTG 53.9 Attack Order 1-44 and Acton Report; (d) COMDESRON One, Action Report and War Diary; (e) Phelps Acton Report; (f) LCC-33 kept on log, and made no action report; (g) COMTRANSDIV 26 FLINTLOCK Report, 18 Feb. 1944. 16. CGFOURTHMARDIV FLINTLOCK Report, Encl. (C), para. 7. 17. CTF 53 FLINTLOCK Report, 23 Feb. 1944, p. 14. 18. CTU 58.2.2 Action Report, 9 Feb. 1944, Encl. (C). 19. CTF 53 FLINTLOCK Report, 23 Feb. 1944, Encl. (B), Subsecton 2. 20. CTF 53 FLINTLOCK Report, 23 Feb. 1944, para. 19. 21. COMLSTFLOT 13 War Diary, 1 Feb. 1944. 22. CO Report of 10th Amphibian Tractor Battalion, 12 Apr. 1944, Encl. (B), p. 2, Encl. (A), p. 1, and Encl. (C), pp. 1-2. 23. TBS Log quoted in Heinl and Crown, The Marshalls (Marine Corps Monograph), p. 71. 24. CTF 53 Roi-Namur Action Report, Encl. (C), p. 5. 25. COMFIFTHPHIBFOR, Observer Comments on FLINTLOCK, Colonel D.Z. Zimmerman, Air Corps, AUS, War Plans Officer, 12 Apr. 1944. 26. (a) COMINCH Operational Analysis of FLINTLOCK, 12 Feb. 1944, COMINCH Chart Room, FLINTLOCK Subject File; (b) CGFIFTHPHIBCORPS FLINTLOCK Report, Vol. III, Encl. (D), G-2 Report and Vol. IV, Encl. (E), G-1 Report; (c) CGFOURTHMARDIV FLINTLOCK Report, Encl. (I); (d) CGSEVENTHDIV FLINTLOCK Report, Vol. III, G-1 Report. 27. CTG 52.5 FLINTLOCK Report, 15 Feb. 1944, Part III, para. 1(b). 28. CTF 53 FLINTLOCK Report, para. 39. 29. CGFOURTHMARDIV FLINTLOCK Report and endorsements thereon. 30. CGFIFTHPHIBCORPS FLINTLOCK Report, Encl. (C), G-2 Report, Encl. (B) Report of Northern Landing Force, para. 3(b). 31. CTF 53 FLINTLOCK Report, Encl. (A), pp. 18-19. 32. COMINCH to CINCPAC, 012115 Sep. 1943. See also CINCPAC to COMINCH 260519 Oct. 1943. 33. (a) CINCPAC-CINCPOA, Joint Staff Study--Marshalls, Ser 00272 of 29 Nov. 1943; (b) Ibid. (Alternate), Ser 00273 of 30 Nov. 1943. 34. Ibid., Ser 0009 of 18 Jan. 1944. 35. (a) COMINCH to CINCPOA 021926 Feb. 1944; (b) COMCENPAC to CTF 58, 031311 Feb. 1944; (c) CTF 51 to CTF 50 021204 Feb. 1944. 36. CTF 51 to CTF 50, 021204 Feb. 1944. 37. Spruance to Director of Naval History, letter, 26 Apr. 1966. 38. CINCPAC to COMINCH, 110106 Feb. 1944; CINCPOA 120441 Feb. 1944; CINCPAC 150749 Feb. 1944; CINCPOA to COMINCH, 142253 Feb. 1944. 39. (a) COMFIFTHFLT (COMCENPACFOR) Op Plan 4-44, 9 Feb. 1944; (b) CTF 51 Op Plan A9-44, 7 Feb. 1944; (c) CTG 51.11 Attack Order A106-44, 9 Feb. 1944, including Annex H; (d) CTG 51.11 Report of Eniwetok Operation, 7 Mar. 1944. 40. Interview with Admiral Harry W. Hill, 29 Nov. 1966. Hereafter Hill. 41. CINCPAC Command Summary, Book Five, 4-8 Feb. 1944, pp., 1849-1852. 42. (a) COMFIFTHFLT Op Plan 4-44, p. 5; (b) VAC Operation Order 2-44 of Tactical Group One, 10 Feb. 1944. 43. (a) JICPOA Bulletin No. 89-44, Colonel Toshio Yano, Commander Engebi Garrison Order of 10 Feb. 1944; (b) CTG 51.11, 242328 Feb. 1944; (c) JICPOA Translation of Japanese Documents No. 7603 and No. 7811; (d) JICPOA Interrogation Report No. 47. 44. (a) CTF 51 130716 Feb. 1944; (b) Hill. 45. COMINCH Operational Analysis, FLINTLOCK Operation, 12 Feb. 1944. 46. COMLSTFLOT 13 War Diary, 12 Feb. 1944. 48. COMLSTGRP 38 Action Report, 21 Feb. 1944, p. 2. 51. COMTRANSDIV 30 Action Report, 6 Mar. 1944, p. 3. 54. Crowl and Love, Gilberts and Marshalls, p. 360. 55. CTG 51.11 Action Report, 7 Mar. 1944, Encl. (A), p. 9. 56. (a) CTG 58.4 132130 Feb. 1944; (b) CINCPAC 152240 Feb. 1944; (c) CINCPAC 092217 Feb. 1944. 57. CTG 51.11 Action Report, p. 9. 59. COMTRANSDIV 30 (CTU 51.14.3) Action Report, p. 4. 60. CTG 51.11 Action Report. 61. COMCENPACFOR 232153 Feb. 1944. 62. CTG 51.11 Action Report, p. 79. 63. Lieutenant Clifford Pruefer, USNR, Report on Support Aircraft Operations, 23 Mar. 1944, p. 5. Filed under Support Aircraft FIFTH PHIBFOR. 64. COMLSTGRP 8 War Diary, 20 Feb. 1944. 65. COMCENPACFLT Report on GALVANIC Operations, Ser 00156 of 10 Dec. 1943, p. 1. 66. COMFIFTHPHIBFOR FLINTLOCK Report, pp. 17-18. 67. CTF 53 FLINTLOCK Report, p. 10. 68. Tawasa (ATF-92) War Diary, 29 Jan. and 15 Feb. 1944. 69. (a) CTG 51.6 FLINTLOCK Report, Ser 0011 of 18 Feb. 1944; (b) CINCPOA, Ser 01228 of 2 Apr. 1944. 70. COMINCH Operational Analysis, FLINTLOCK Operation, 12 Feb. 1944. 71. CINCPAC to COMINCH, 030323 Feb. 1944. 72. (a) COMINCH to SECNAV, 041259 Feb. 1944; (b) SECNAV to COMINCH, 04120 Feb. 1944; (c) COMINCH to CINCPOA, 121451 Feb. 1944. 73. CINCPAC to COMINCH, 202903 Feb. 1944. 74. Congressional Record (78th Congress, 2nd sess), Vol. 90, 13 Mar. 1944. 76. Time Magazine, 7 February 1944, p. 19. 77. Ibid., 21 February 1944, pp. 25-27, 29. 78. Robert S. Heinl, Soldiers of the Sea (Annapolis: U.S. Naval Institute, 1962), note 38, p. 637. 79. COMINCH to CINCPOA, 142139 Feb. 1944. 80. Forrestel, Spruance, p. 103. 81. COMFIFTHPHIBFORGRP Three to COMPHIBFORPAC, letter, A16-3/6639/15 Mar. 1944.